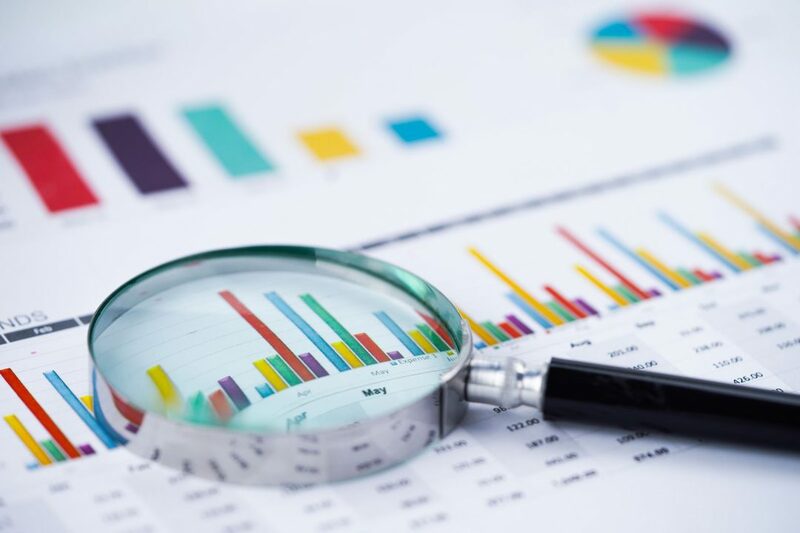 In December 2018, the World Intellectual Property Organization (WIPO) published its annual World Intellectual Property Indicators 2018 report, which shows IP statistics worldwide. Patent filings around the world reached 3.17 million, representing a 5.8% growth on 2016 figures, trademark filings totalled 12.39 million, up 26.8% on 2016, and industrial design filing activity exceeded 1.24 million. China recorded the highest application volume for each of these IP rights. Regarding patent filings in the Latin American and the Caribbean region, WIPO´s study report a slight decrease (-0.1%) on the average annual growth from 2007 to 2017, with 57,600 patents filed in 2017. On the other hand, trademark filings in the region showed a 3.3% increase on the average annual growth over the same period, reaching 715,900 applications in 2017. This average percentage annual growth was similar to that for North America (3.9%) and higher to the one in Europe (0.2%). Industrial design filings during the 2007-2017 period in the Latin American and the Caribbean region also shows a slight average annual increase (0.6%), with 15,500 filings in 2017. Below are IP data for the period 2007-2018 according to the statistics published by the corresponding PTOs of the top five largest Latin American economies: Brazil, Mexico, Argentina, Colombia and Chile. From 2007 to 2018, patent filings in Brazil have increased 15% overall. However, the number of applications has fallen for five consecutive years, with the decline in non-resident applications being the main driver for the decrease. From 2017 to 2018, there was a slight reduction from 28,667 to 27,551 (-3.9%) in patent filings, although there was a large increase (77.5%) in patent grants, rising from 6,250 in 2017 to 11,090 in 2018. Additionally, in 2018 the patent backlog was reduced by 7.4% with respect to 2017. In 2018, applications from the U.S accounted for 30% of the total patent filings, followed by Brazil (20%), Germany (8%) and Japan (7%). 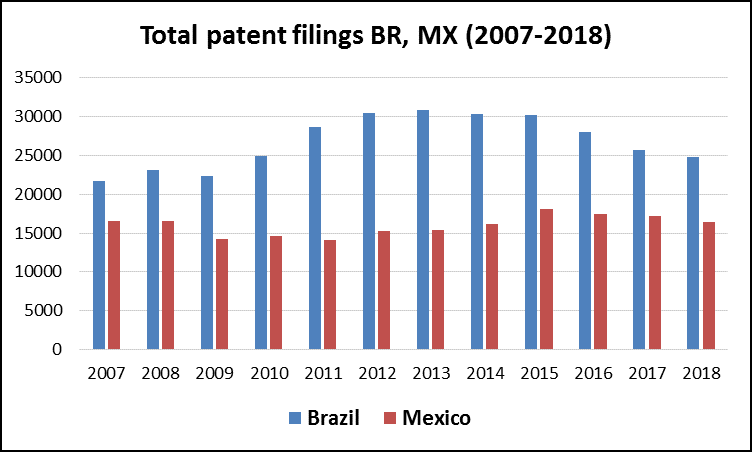 Mexico has experienced a slight overall decrease (1%) in patent filings from 2007 to 2018, with 16,424 applications filed in 2018. Regarding patent grants, 8,921 applications were granted in 2018, 5% more than in 2017. Applicants from the U.S. accounted for 44% of the total applications in 2018, followed by Mexico, Germany and Japan (7% each). Patent filings in Argentina have also experienced a decrease over the last years, with 3,443 applications filed in 2017. Interestingly, during the 2016-2017 period, there was a 56% decrease in resident applications, whereas non-resident applications slightly increased (4%). Regarding patent grants, these have almost doubled in the period 2008-2017, with 2,302 patents granted in 2017. No data are yet available for 2018. 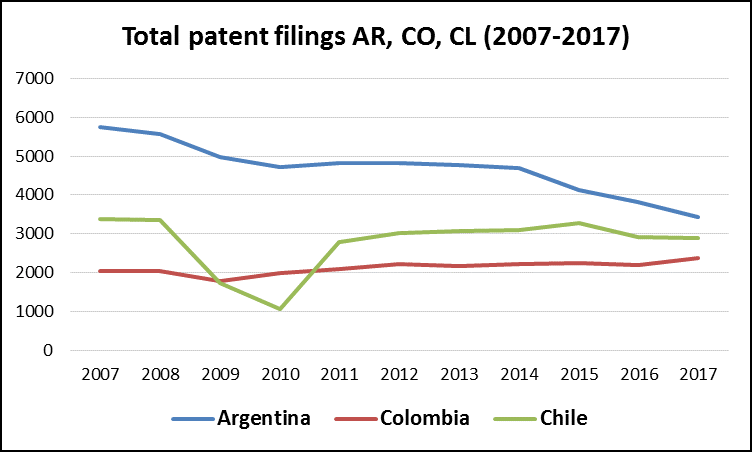 Except for a marked decrease during 2009 and 2010, patent filings in Chile have been rather steady, with a slight 7% increase from 2017 (2,892) to 2018 (3,100). 30% of the applications in 2018 were from U.S. applicants, 13% from Chile, 9% from Switzerland and 8% from Germany. Colombia also recorded a 7% increase in patent applications from 2017 (2,049) to 2018 (2,372), and a remarkable 16% growth for the period 2007-2017. In 2017, 32% of the filings were from U.S. applicants and 25% from Colombian applicants, followed by Switzerland, Germany and France in number of applications. No data are yet available for 2018. 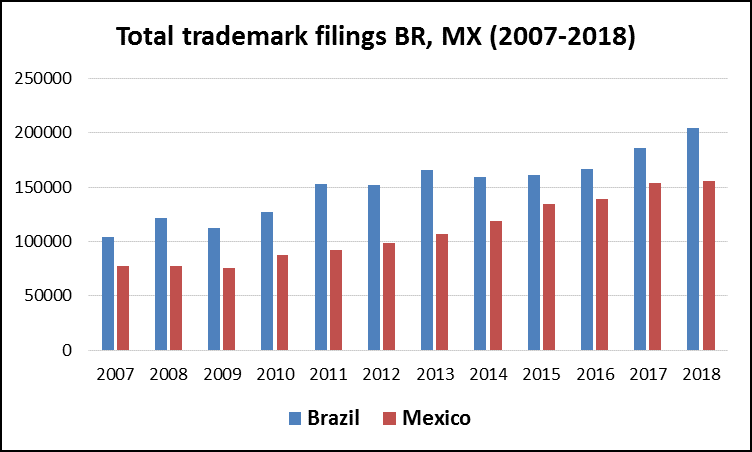 Regarding trademark applications, both Brazil and Mexico have seen an overwhelming growth during 2007-2018: applications in Brazil have increased 96% since 2007, reaching 204,419 applications in 2018, whereas in Mexico this increase went up to 103%, with 156,156 applications filed last year. Resident filing activity has driven this growth in Brazil, with an average of 82% in resident filings during the period 2007-2018. The second country in number of trademark applications in Brazil is the U.S., whose share in 2018 was 4%. Resident filings in Mexico represented an average of 68% during the period 2007-2018. The second country in number of trademark applications in Mexico is also the U.S., with 17,449 applications (11%) filed in 2018, followed by Germany (3%). There has been a significant increase in trademark registrations in Brazil during the last year, from 123,362 in 2017 to 191,813 in 2018 (55.5%). More importantly, the backlog was reduced from 358,776 by the end of 2017 to 191,535 by the end of 2018, which represents a decrease of 46.6%. Trademark registrations have increased 150% in Mexico during the period 2007-2018, rising from 49,746 registrations in 2017 to 124,023 in 2018. With an overall 4% increase in trademark applications in Argentina from 2007 to 2017 and 74,722 filings in 2017, resident applications represented an average percentage of 76% during the period 2007-2017. 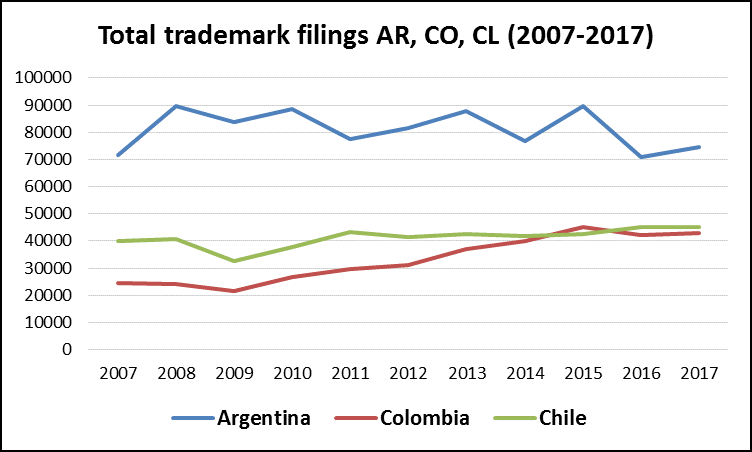 Except for a drop in 2009, trademark filings in Chile have been rather stable, with an overall increase of 18% during the period 2007-20018 and 47,407 filings last year. Resident applications in Chile represented an average of 69% during the period 2007-2018. Colombia has experienced a significant overall increase (73%) in the number of trademark applications during 2007-2017, with 42,725 filings in 2017. Resident applications in Colombia showed an average of 57% during the period 2007-2017. There has also been a substantial increase (71%) in trademark registrations in Colombia during 2007-2017.